First, Let’s Start WithÂ A Video. The video below, created by the Long Beach timebank beautifully shows how the place-based, neighbor-helping-neighbor model of timebanking works. Timebanking is a kind of money. Give one hour of service to another, and receive one time credit. To be successful, timebanks need leadership â€“ or perhaps the better word is â€œgovernance.â€ They need agreements around whatâ€™s OK and whatâ€™s not OK in relation to earning and spending. To guide those, one additional and most important aspect of timebanking is the core values. Edgar Cahn is the founder of modern timebanking. He noticed that successful timebanks almost always work with some specific core values in place. In his book No More Throw-Away People, he listed four values.Â Later, he added a fifth. These have come to be widely shared as the five core values of timebanking â€“ and most timebanks strive to follow them. They are a strong starting point for successful timebanking. Assetâ€¨ Every one of us has something of value to share with someone else. Redefining Work There are some forms of work that money will not easily pay for, like building strong families, revitalizing neighborhoods, making democracy work, advancing social justice. Time credits were designed to reward, recognize and honor that work. Reciprocity Helping that works as a two-way street empowers everyone involved â€“ the receiver as well as the giver.â€¨The question: â€œHow can I help you?â€ needs to change so we ask: â€œWill you help someone too?â€Â Paying it forward ensures that, together, we help each other build the world we all will live in. Social Networks Helping each other, we reweave communities of support, strength & trust. Community is built by sinking roots, building trust, creating networks. By using timebanking, we can strengthen and support these activities. Respect Respect underlies freedom of speech, freedom of religion, and everything we value. Respect supplies the heart and soul of democracy. We strive to respect where people are in the moment, not where we hope they will be at some future point. 1:1 â€“Â One person gives another person a ride to the doctor. 1:Many â€“Â A yoga teacher earns credits teaching a yoga class to four other members. Many:1 â€“Â Four members earn credits doing a garden clean-up for a senior. Many-Many â€” A whole lot of people earn credits organizing and participating in a community pet-parade. Letâ€™s take a look at that last many-many example again â€“ the Community Pet Parade. Organizing the Pet Parade could quickly burn up 200+ hours of volunteer time. Question: Who pays out the credits? Answer: An organizational member â€“ like a school, or the timebank itself â€“ could have paid them out. Or (and this hasnâ€™t happened yet â€“ but it could) a timebank could be created for the primary purpose of organizing a pet parade on an annual basis to benefit various causes in the community. Since the parade is a public event, no-one spends any credits to attend.Â The sponsoring organization gets no time credits in return. But this is not a problem.Â When community happenings are organized by a sponsoring organizational member or the timebank itself, the time credits paid out to members for their help are seen as a measure of community investment.Â This time credit “debt” has produced a good for the community! Edgar believed that Timebanking could also play a powerful role in achieving a more equal society. Thatâ€™s because the â€œgolden ruleâ€ of timebanking is this: All hours are equal, regardless of the nature of the act. An hour of baby-sitting earns one time credit. An hour of legal help earns one time credit.Â An hour of kitchen clean-up earns one time credit. Timebanks may use paper notes for their time credits. Many timebanks use on-line timebanking software. The software makes it possible to keep track of who are the timebank members, what are the services they offer or seek, and what services they have actually given or received. Currently, the majority of timebanks use the neighbors-helping-neighbors model, where members are free to choose what services they would like to offer â€“ either to other members or to the community at large — and also what services they will request. Services offered and requested vary from timebank to timebank â€“ but there are some consistent favorites.Â Transportation is one. Minor home repair is another. Computer help is a third. Timebank networks can choose instead to target specific kinds of services. Another targeted timebank project is in the juvenile justice system. Teens earn time credits for volunteering as teen jurors. A third example of a targeted timebank or timebank project is the annual pet parade discussed above, where everyone earns and spends time credits in service of making the annual pet parade a grand success! Timebanks can be small: as few as 20 people. At the other end of things, they can include thousands of members. Most often, they are organized locally. However, a timebank can span continents. Although the basic rules are fixed (an hour for an hour and the five core values), how each timebank is structured, and what its focus is depends on the choices of its founders, leadership and members. But it is important to remember that in timebanking, both receiving and giving have equal weight. People cannot give if others will not receive â€“ the two are bound up together. And mutual value is found through both. You can take up timebanking in two ways: join a timebank that has already been created â€“ and start giving and receiving services with other members; or form a team to create a new timebank and invite people to join. Edgar Cahn, who founded timebanking, wrote in his book No More Throw-Away People that he was seeking with this new kind of money to foster â€œdecency, caring, and a passion for justice.â€ That is a huge umbrella, and under it, many things fit. Currently, the most common model of timebanking focuses on neighbors-helping-neighbors to help the most vulnerable and to build a strong sense of community. But in some places, people and organizations are approaching timebanking as an opportunity to design targeted uses of timebanking to achieve specific goals. Â·Â Â Â Â Â Â Â Â Strengthened the sense of community. Â·Â Â Â Â Â Â Â Â Improved learning at school. 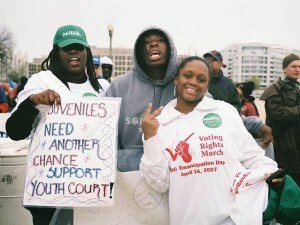 Â·Â Â Â Â Â Â Â Â Reduced the school-to-prison pipeline. Â·Â Â Â Â Â Â Â Â Helped public housing residents save money. Â·Â Â Â Â Â Â Â Â Supported hospital patients as they return to regular life at home. Â·Â Â Â Â Â Â Â Â Brought art and music into a community. Â·Â Â Â Â Â Â Â Â Helped seniors remain at home as they age. Giving, Receiving â€“ Is Each As Good As The Other? The Pet Parade example above demonstrates something about giving and receiving in a timebank. Depending on the context, Timebanking will often assign equal importance to receiving as well as giving. The organization that sponsored the parade received hundreds of hours of services from timebank members. It went into â€œdebt.â€ But this was seen as a plus! Unlike the money economy, where debt is often considered a bad thing, giving and receiving can both be valued as contributing to the purpose of building stronger ties in community. Yet consider this: A member gives many services to many other members. She earns a ton of time credits. Then she finds she cannot use the hours that she earned to get help because members donâ€™t respond to her requests. Thatâ€™s not good. That member will feel that the imbalance between giving and receiving isnâ€™t good: it wonâ€™t feel fair. This example shows how timebanks are always involved with our expectations and experiences around the simple notion of giving and receiving. We come with different expectations. We see giving and receiving through different lenses of experience. Some want only to give. Others place more value on what they can get. Some feel itâ€™s wrong if giving and receiving donâ€™t balance out. In real life, the simple equation of 1-1 and that an hour of giving = an hour of receiving can raise deep, unexamined feelings â€“ and when lots of people are involved, that can get complicated! Timebank members in many timebanks keep track of their exchanges using timebanking software. They use the software to enter data about themselves, what they can offer, and what they would like to receive, to record their exchanges, track their hours, and learn about timebank members and events. keep records of those payments, and so on. There are numerous timebank software programs available. These include TimeRepublik and hOurWorldâ€™s Time and Talents, and Community Forge. Here at TimeBanks USA, we have designed Community Weaver 3, to help local neighbor-helping-neighbor timebanks get organized. Users tell us they find CW3 easy for time bank members to use. CW3 also has a host of features to help timebank leaders and coordinators encourage giving and receiving through their timebank. If you are interested to see a short video describing CW3â€™s features, click here. sharing the story of the timebank; spelling out to funders and supporters the value that the timebank exchanges provide to the members and to the community at large. In a world that is dominated by money, it helps all timebanks to know that their sustainability will depend on their members being sure that the timebank brings them value. To inspire loyalty and passionate commitment by timebank members and champions, what that value is and how it is achieved needs to be clear, relevant, and well understood. Thatâ€™s not always easy when people come to relationships of giving and receiving with such different background experiences and varying expectations. Here is where spelling out and staying true to the five core values of timebanking can greatly help. There are basically two ways to take up timebanking. You (or your organization or your project) can become a member of an existing timebank if there is one nearby.Â Search our Community Weaver Directory for Timebanks near you. But that may not work for you. If there is no timebank in place, or if the mission of a timebank near you is different from what you want to achieve, a second option is to create a new timebank. Below is a description ofÂ a Neighbor helping Neighbor model. TimeBanks in many cases use timebanking software to manage all the information that members supply and to keep track of exchanges. The software provided by TimeBanks USA is called Community Weaver.Â Among the many others versions of timebanking software are TimeRepublik,Â Time and Talents, and Community Forge. Many timebanks also use social mediaÂ and/or a websiteÂ toÂ complement the timebanking software they use. This is where members sign up and learn about TimeBanking. Orientations are a key step for new members to become full-fledged members of a timebank. Strong orientations provide new members with information as to the overriding purpose of the timebank, the core values of TimeBanking, how the timebank software works, how exchanges take place, the responsibilities of membership and more. Orientations may be group or individual. They may be formal, with a set agenda and planned activities, or more informal: sit in a small group, listen to the coordinator describe what itâ€™s all about, learn about the software, and then ask questions. In group orientations, the orientation leaders will often try to ensure that each new member has agreed to enter into an exchange that will make the experience real, early on. Neighbor-helping-neighbor TimeBanks use member potlucks as a way to build up exchanges between members. Gatherings work best if they are held regularly so that members can plan for them in their calendar.Â For many TimeBanks, the pot-lucks are a KEY component, because itâ€™s here that people get to meet and become familiar with other TimeBank members and find out whoâ€™s exchanging what. Monthly potlucks help build the relationships that power the TimeBank. They are also useful for outreach, and so they are generally open and inviting to non-members who are interested in joining the TimeBank. The potluck is the place to celebrate and share. To be reminded of the core values. To announce events. To have fun and activities that will help TimeBank members come to know all the wonderful things that other members do. TimeBank projects and events bring a life of their own to a TimeBank by calling on timebank members to dream out loud about things they want to do and achieve. Think of making 300 hundred sandwiches for homeless shelters. Or painting the underpass where the local farmers market gathers every weekend. Or a wellness day that celebrates and teaches the many ways to remain healthy and strong. On this front, we are limited â€œonly by our imaginations!â€ Two great sources of ideas are the Timebank Coordinators Idea Exchange facebook group for timebank coordinators, and the TimeBank Knowledge Commons. You can also go to our TimeBank Directory to explore what different TimeBanks offer. TimeBanks have policies and information they need to share. These include membership requirements, guidelines on conducting TimeBank exchanges, leadership roles and so on. Even to say â€œwe will have as few policies as possibleâ€ is a policy! TimeBanks vary greatly in the level of formality of the policies and the procedures they put in place. For example, some require new members to provide references, a background check, and to attend an orientation before their membership is approved. The Handbook is where to find that information. It may be printed. Or your TimeBank may prefer to have that available online, either on the timebanking software, or through a website or facebook group. We have described the things that a Neighbor-Helping-Neighbor Timebank does. But to do those things it also needs some structure. All timebanks share some key elementsâ€” but how they put those elements together will depend on the timebank’s purpose, who the members are, and what they do to achieve that purpose. As an example, the Dane County TimeBank in Madison, WI is a Neighor-to-Neighbor timebank. But it also includes a youth court! In contrast, the former DC Youth Court in Washington, DC, (sadly defunded at this time, but seeking to be reborn) was a stand-alone, special purpose timebank.Â To see a Timebank Youth Court in Action, watch this video. TimeBanks need leadership. They cannot be sustained without it. They need leadership that operates on different levels. Thereâ€™s the day-to-day making-it-happen leadership that helps with membership exchanges which is carried by timebank coordinators. Coordinators may be unpaid members of the timebank.Â They may, alternatively, be paid staff. more formally, a board with by-laws whose members are elected or appointed according to the rules laid out in the by-laws. Which of these levels of formality applies will often depend on how long the timebank has been going. The longer a timebank has been in existence, the more formal the leadership is likely to be. It takes a range of skills and capacities to get a timebank going. It takes at least one â€œpeople-personsâ€ who will be passionate about connecting people. You will also need a person who loves order and structure, and will keep orderly records, write up meeting minutes, and so on. Regular meetings, and clear expectations for leaders and members are helpful. At the same time, too much focus on policies, rules and procedures can get in the way of the spirit of giving and receiving that is characteristic of a strong timebank. Very rarely, a single individual creates and builds up a new timebank. More often, it takes a dedicated start-up team to achieve the right balance between leaders with relationship-building and structure-building skills and outlooks. Timebanking exchanges stand outside the money economy. Because of that, there is a widely shared belief that timebanks should not need money. But costs inevitably arise, even when members to do the work of running the timebank for time credits. Phones, computers, spaces to meet, fuel, food. The occasional professional help. All these cost money. For example: Member-led Neighbor-Helping-Neighbor timebanks with no paid staff may still find costs rising to $20 or more per member per year. Adding a part-time staff person can quickly lift that amount closer to around $80 per year. And a fully-staffed timebank with a specific focus may cost far more â€“ up to several hundred dollars per member annually. There is also the cost of the overarching infrastructure that supports the timebanking movement: websites (including this one), online timebanking software, materials for information, training and technical advice and support. At a rough estimate, they add $10 per timebank member per year for generalized support. For timebanking to be truly sustainable, the costs of building timebanks and the larger infrastructure should be carried mostly by the movement itself. But at the local level, many timebanks struggle to achieve their goals with too little money, and at the overarching movement level, organizations like TimeBanks USA also face a sustainability challenge. For example, the software, communications, and training that timebanks rely on is mostly free, and there is an easy and widely shared expectation that this is the way it should naturally be. So the question is: who will bear those costs, and why? This means taking a real hard look at every level. Who receives value, and who will contribute? Will the members of the timebank step forward and contribute annual dues? Will timebank leaders support the infrastructure in a larger sense? Will others, not directly involved, make contributions? The question will always be: Why? The fact is, all involved will be constantly figuring out how much value they receive for the effort they put in and the money they might contribute. 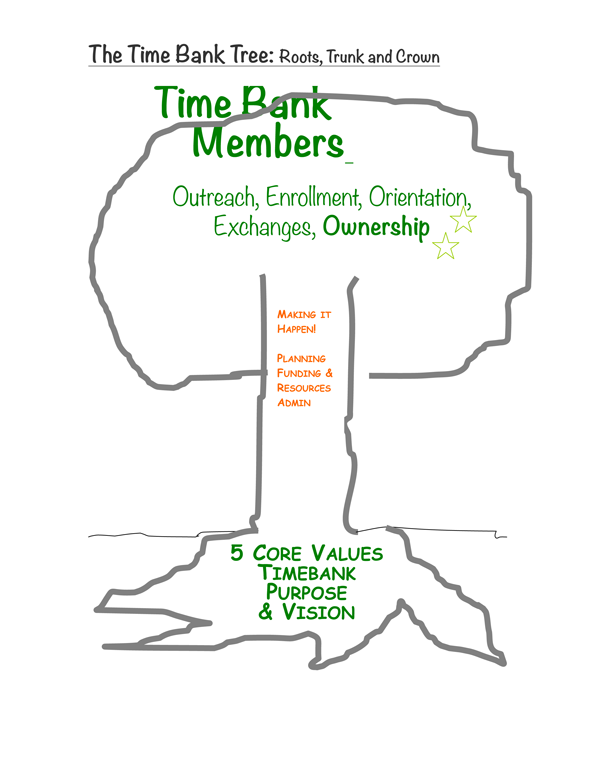 For the idea, and the core values embodied by the timebank and its members. To have meaningful relationships and the opportunity to meet individuals they would be unlikely to meet any other way. For services that members could not afford with money. To build a stronger sense of self and community. To fulfill their own sense of mission and purpose. The five value propositions are a good start. But theyâ€™re too broad and general by themselves to be more than a rough guide for sustainability purposes. At all levels â€“ from local to regional to national to international â€“ itâ€™s the specifics that count. What are the specific kinds of relationships that members want and seek out? What specific services do members seek to give and receive and just how much do they value them? In what specific ways is their personal and their communityâ€™s development supported? And how, specifically? How, specifically, is their own sense of mission and purpose supported? If these are being activated, the people who receive value through your timebank will willingly become the best ambassadors for ongoing sustainability. But budding ambassadors have to be asked and invited to take that on! And then they must be recognized and thanked. This is true for all levels of the timebanking movement. And yes, it is a challenge. But Â a good challenge â€“ because, luckily, thatâ€™s what timebanking is all about! The tree can be a useful metaphor for a timebank. Rooted in community, the timebankâ€™s mission, its membersâ€™ desires and passions, and the core values of TimeBanking, timebanks develop in organic, diverse ways. 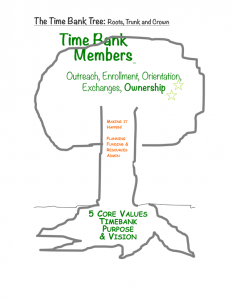 Above the roots, the trunk stands for the rules and roles, the policies, and activities needed to keep the timebank running day-to-day and evolving and growing. And then thereâ€™s the fruit-bearing crown â€“ and all the good things that come out of the membersâ€™ actions: potlucks, the exchanges, the orientations. The metaphor draws attention to the question of sustainability. Like trees, timebanks must grow in proportion. Growth means deeper roots; a thicker trunk; a larger crown. Growth also means dynamically interacting with the natural environment. These are things to think about and act on. To end, here is the hope that this (somewhat lengthy!) introduction has been helpful, and that your timebanking endeavor â€“ whatever it will be â€“ is beneficial to you and to others, and that over time, it will grow and prosper.